September 1, 2013. The personal pay will now be in the range of Rs 210 to Rs 1,000 per month, depending on the post the sportsperson holds. “The personal pay will be related to the Grade Pay corresponding to the post against which the employee concerned had initially earned or will earn the personal pay. All other terms and conditions governing the grant of special increment shall remain unchanged,” an office memorandum dated September 19, 2013 said. The personal pay is granted from the first of the month following the month in which the sporting events are completed, and will not count for any service matter like pay fixation on promotion, retirement benefit or DA/CCA etc., the OM has clarified. For the sportspersons working in Indian Audit and Accounts Department, the hike will come through only after due consultation with the Comptroller and Auditor General of India. Some of the sporting bigwigs are in fact government employees. For example, Olympic silver medal winner Sushil Kumar is a full-time employee of Indian Railways. According to a statement by Indian Railways issued last year, railway personnel managed to win as many as 25 medals in the Delhi Commonwealth Games, 2010, and 15 medals in the Asian Games. Also, 12 sportspersons from Indian Railways were a part of the Indian contingent, participating in the Olympics-2012 being held in London. 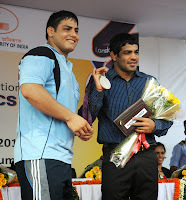 Irrespective of whether a sportsperson works with the government of not, a medalist at an international event also gets pension under the exiting government schemes. For example, a medalist at the Olympic Games is entitled to get a pension of Rs 10,000 per month. Similarly, gold medalists at the World Cup or World Championships in Olympic and Asian Games disciplines, get Rs 8,000 per month as pension. The silver and bronze medalists at the world cup or world championships in Olympic and Asian Games disciplines are entitled to get a pension worth Rs 7,000 per month.